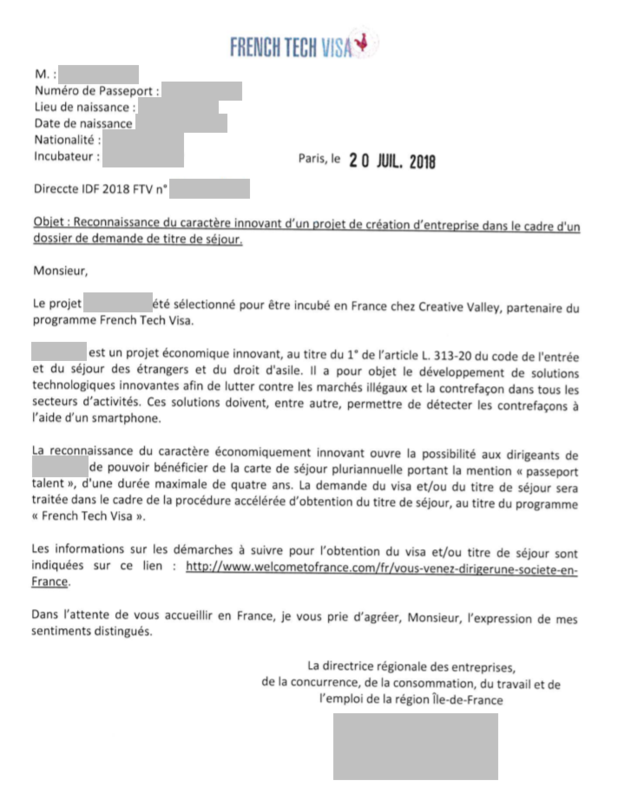 How to get a French “Passeport Talent” or “French Tech Visa” for startup founders? How do you create a startup in France? What Visa can you get ? What if you've been accepted at Station F or any other French accelerator? What is the best visa option ? 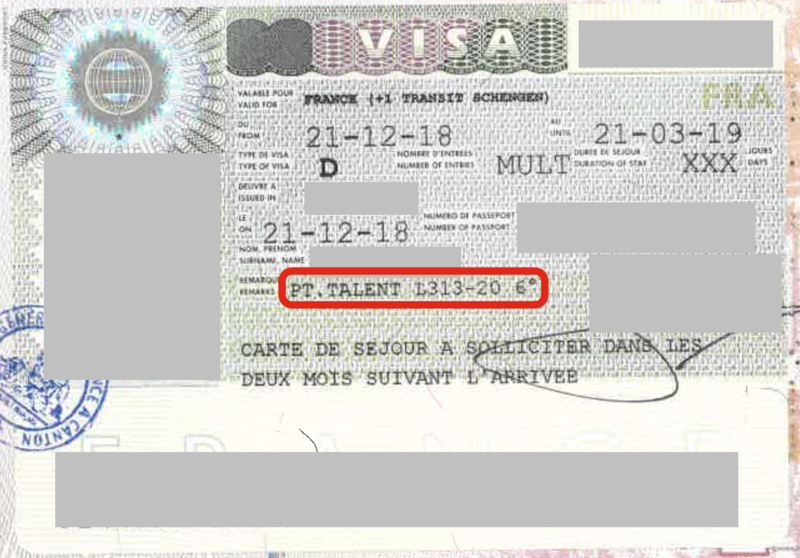 I have heard of a "simplified" procedure for you and any co-founders to get a four years residence permit (carte de séjour) also called "Passeport Talent" or "French Tech Visa". How does it work ? The procedure does not seem that simple and the lack of information is infuriating. Disclaimer: Having been through the process, I'm providing my own answer to help future startup founders. This is my feedback. I might be wrong on some points as some of this might not apply to your situation. Feel free to ask any separate questions on this site referring back to this question, or add your own experience as a comment. 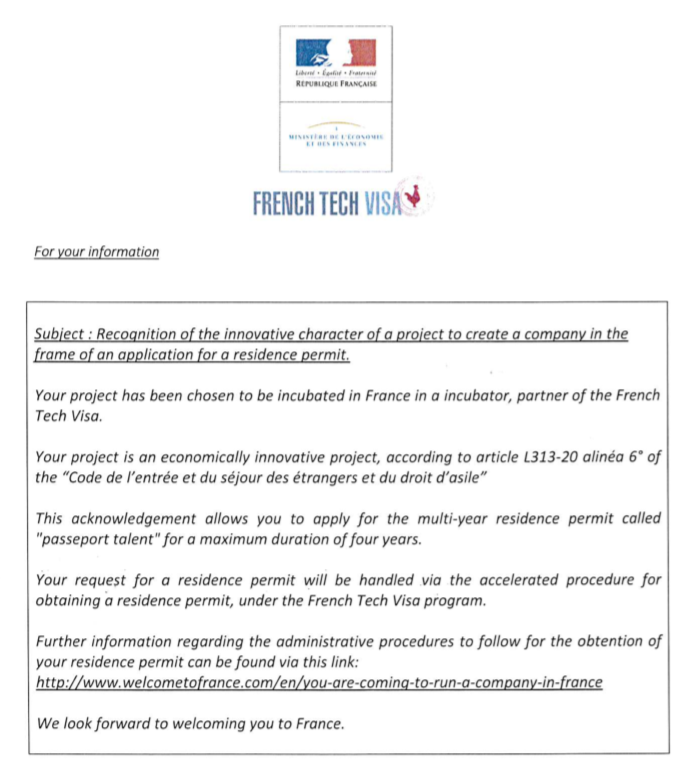 Together let's build French Tech Visa's missing reliable source of information. Not all startup accelerators partner with this visa ! So make sure to check ! Some are free, some cost a monthly fee, some will take some equity and give you some cash in exchange. Once you have applied to the program and once you're accepted. You should go to this website and upload a proof that you are part of the accelerator : https://www.demarches-simplifiees.fr/commencer/passeport-talent-entreprise-innovante Unfortunately, this website is only in French for now... Ask help from your program manager to do the upload. Make sure he sends you a scan AND the actual paper version. Some embassies are fussy about this. Once you have this invite letter, you need to know how to apply for a visa at the nearest French Embassy. This varies from countries to countries. Websites rarely help. The surest way to know is to go to the embassy, without appointment. Ask them how you are supposed to apply for a visa there. What is the procedure to book an appointment ? What building are you supposed to go ? What are the time schedules of the visa part of the embassy ? How much are you supposed to pay for this visa ? What form are you supposed to fill ? Show them the invite letter to explain what you're looking for. This is not a normal visa. Usual visa agencies have no clues about it and some embassies themselves also have no clues on what to do. The point is. You'll get a visa that will allow to go to France and stay for three month. You won't get the actual passport Talent at the embassy ! It's just a first step that allows you to go to France and start the process. Once you have an appointment at your embassy, you will have to show them some documents. -A birth certificate and a photocopy of it. Or anything closely related. -The invite letter I showed previously and a photocpy of it. Insist to keep the real one, hopefully they'll let you. -Maybe, this depends on the embassy, they will ask a proof of address. Like electricity bill (less than 3 month old), or renting contract. Keep a copy of all of those documents !! You will need them later on ! That's not the end of the journey though. In your luggage, take your birth certificate and all the documents you used on step one. Before you arrive in France, or once you arrive in France, you need to take an appointment with Préfecture de Police (police bureau) If you are in Paris. The Préfecture in charge of French Tech visa is situated at : "Prefecture de Police Place Louis L'épine" https://maps.app.goo.gl/oJ3if You're looking at Bureau 1511 inside the building. Let's go through this one by one. Form to fill. Ok. Nothing tricky there. Hopefully they have an Engliash version that they send you by email. Visa de long séjour valant titre de séjour -> You have that in your passport already. 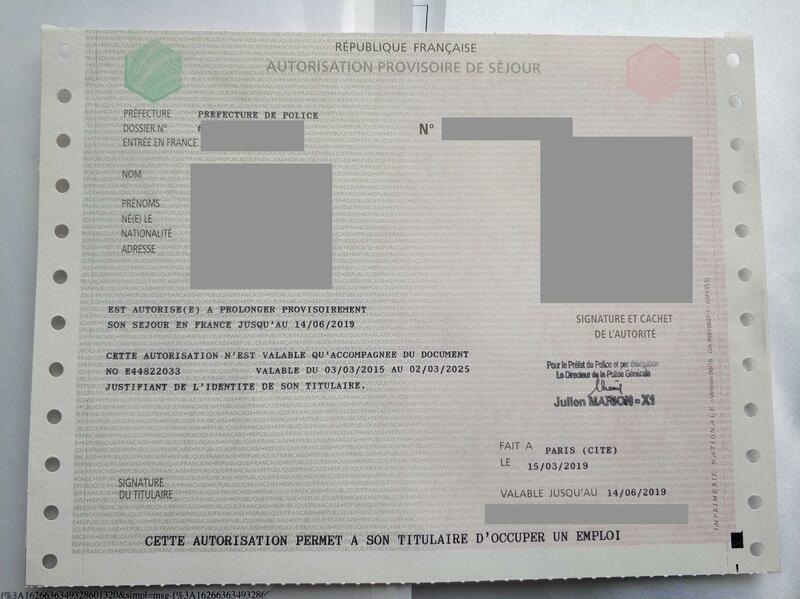 Justificatif d'état civil et de nationalité -> Your passeport your birth certificate. AND. A FRENCH TRANSLATION of it ! Yes, even if you have an english version of your birth certificate, they have the right refuse... Any document (except your passport) which is not in French can and will be refused. Also... They don't just want a translation, they want a translation from a "certified translator" e.g. a translator, based in France that has the right to translate legal documents. Now make sure you get a document from the certified translator that proves that he is indeed certified. Justificatif de domicile datant de moins de 3 mois -> They want a proof of address. Either an invoice from a hotel + document from the hotel or a certificate from someone who host you. If it's a certificate from a friend who host you, they need a paper where he certify that he host you. A photocopy of his ID card or residence permit and a rental contract or property certificate. All of this should be in French too. Justificatif d’acquittement de la taxe sur le titre de séjour et du droit de timbre -> This you don't need to worry about at this point. Justificatifs de moyens d’existence correspondant au salaire minimum de croissance correspondant à un temps plein. -> A minimum one year Contract from any company (French or foreign) that give you more than 1500 eur salary per month. The easiest way is for you to sign a contract with your company giving yourself more than 1500 eur salary per month. Because they have no way to know if your company actually has the money to pay you or if you even received this salary, especially if it's a foreign company. Again, any documents you bring have to be in French or translated by a certified translator. You will have a temporary paper that give you the right to stay in France. Using this paper you can stay in France for as long as you want, go abroad, come back. It counts as a visa for you (you still need to carry your passport though). After 1-2 month, your residence permit card is ready, you will be notified by SMS and have an appointment to go pick it up. They will keep your card there for 3 year waiting for you to pick it up, so no worries if you can't be there at the right time. In any case, you need an appointment to come pick it up. The place is the same "Prefecture de Police Place Louis L'épine" https://maps.app.goo.gl/oJ3if but you have to go to Bureau 5. Okey, that's about it :-) This is my current experience. Again I might be wrong on some points or some points might have changed. Please feel free to edit or tell me in comments anything that changed and need to be modified ! Not the answer you're looking for? Browse other questions tagged france or ask your own question. As an EU national just moved to France, how do I get a “Attestation d'accueil” for a friend's visa? Are there alternatives to a cheque for “caution” (deposit) when renting as a new arrival in France? Does anyone know about the “Carte de commerçant étranger”? Rights for spouses of EU citizens; French residence permit in a timely manner? W8-BEN / W9 mandatory for J2 (J1-dependent)? If so, how to get an ITIN? Carte de séjour in France if I already have a long-stay visa--what's the point?